MISSOULA, MT, April 21, 2015 – Spectrum Aquatics, a leading manufacturer of commercial pool equipment, is pleased to announce that the innovative Glacier Platform Lift has been specified in several major new pool construction projects this year. The Glacier Platform Lift represents a major advancement over other methods of pool entry because it is the only US-manufactured lift designed to be a part of the pool itself. The Glacier Platform lift has been installed by key pool builders in the Canadian market, and feedback from US designers and consultants indicate that the Glacier is the preferred lift for therapy pools. 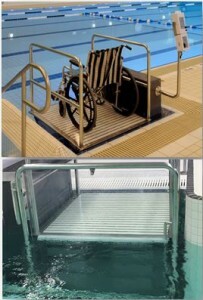 The innovative patent-pending design enables easy and safe pool access without compromising pool aesthetics and allows patrons to enter and exit the pool with dignity – similar to a ramp but at a fraction of the space. Another advantage of the Glacier Platform Lift is that when adding a ramp, builders have to adjust gallonage, flow rates and square footage of the pool. The Glacier, however, allows the operation of the pool to stay true to the original design. The Glacier requires minimal assembly, can be battery or water powered, easily installs with 4 drop-in anchors, has a notably quiet and stable operation, and is rated with a 600 pound loading capacity for both standing and wheelchair-seated individuals. A gated entry and exit system is included for added safety, and the lift can be manually operated in emergency situations. Spectrum Aquatics is a leader in the aquatics industry and has been committed to the development of high-quality competitive swim and commercial aquatics equipment for the past 40 years. The company is headquartered in Missoula, MT and is a division of PlayCore. More information is available about Spectrum Aquatics at https://www.spectrumproducts.com. PlayCore helps build stronger communities around the world by advancing play through research, programs, and partnerships. The company infuses this learning into their complete family of brands. PlayCore combines best in class planning and education programs with the most comprehensive array of recreation products available to create solutions that match the unique needs of each community we serve. More information is available about PlayCore at http://www.playcore.com.